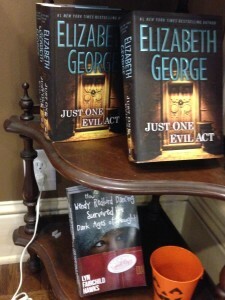 Meeting Elizabeth George, at the McIntyre’s visit for the release of Just One Evil Act. Wendy in the same vicinity of Elizabeth George’s work? How cool is that? Writing isn’t just about talent expressed in an isolated garret. Writing needs patrons–the grant foundations, awards programs, and writers’ networks, such as the James Jones First Novel Fellowship, A Room of One’s Own foundation, and the North Carolina Writers’ Network. I see these awards as faith in my blueprints and celebration of the first steps I took to start the building. The gift from the Elizabeth George Foundation was the cornerstone that started my career. Now people can see the home I’ve begun where many stories will live. 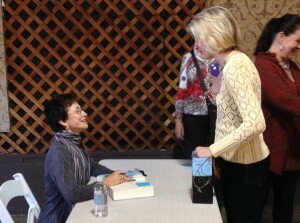 I aspire to be like Ms. George who has written over 20 books and made more than a mark on her genre. I am so grateful to all these groups that saw fit to give me opportunity, time, and funding for my work.